Today, we discovered the value of Hotwire.com. We spent the previous arranging a rental car for the next phase of our journey. The best we could come up with was about 575 bucks for 9 days. My brother, Gord, had told us about Hotwire, so we tried it. What a bonus, not only did we arrange a rental car for $260 , we booked 4 star accommodations at a Marriott Hotel in Mont Tremblant for $139 a night. SCORE!!! 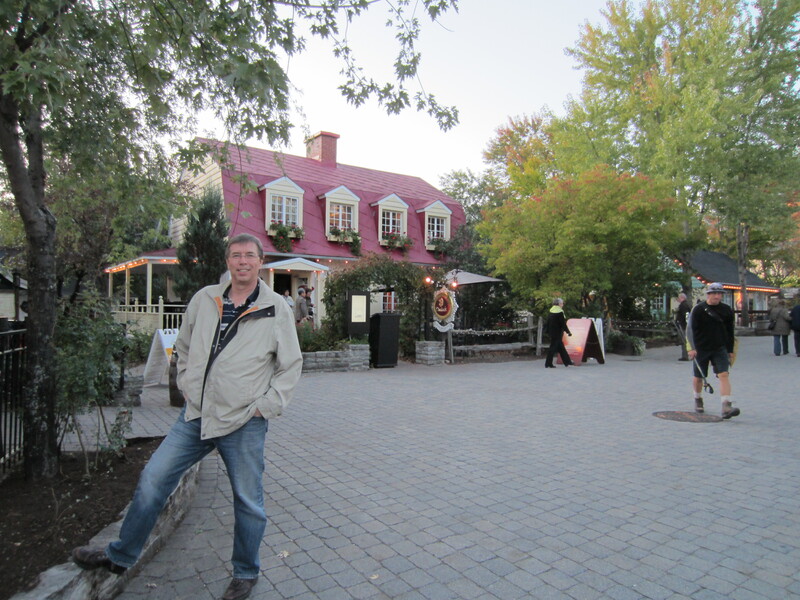 So we were armed with a vehicle and a place to stay, it was now time to leave Ottawa behind and head into the glorious fall foliage to, first, Gatineau Park, north of Ottawa, then to Mont Tremblant in Quebec. 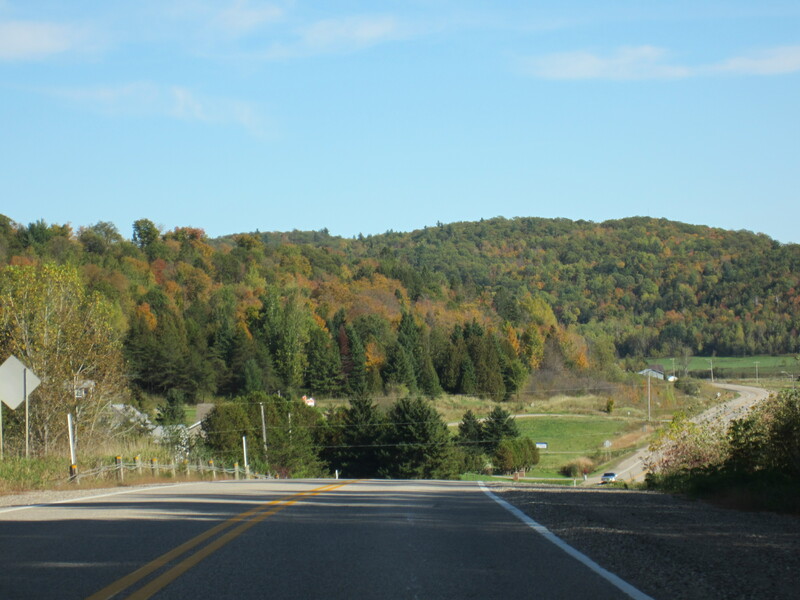 We were looking forward to this drive as it was the most perfect time of year, with the leaves changing colour and amazing terrain in the Laurentian Mountains. 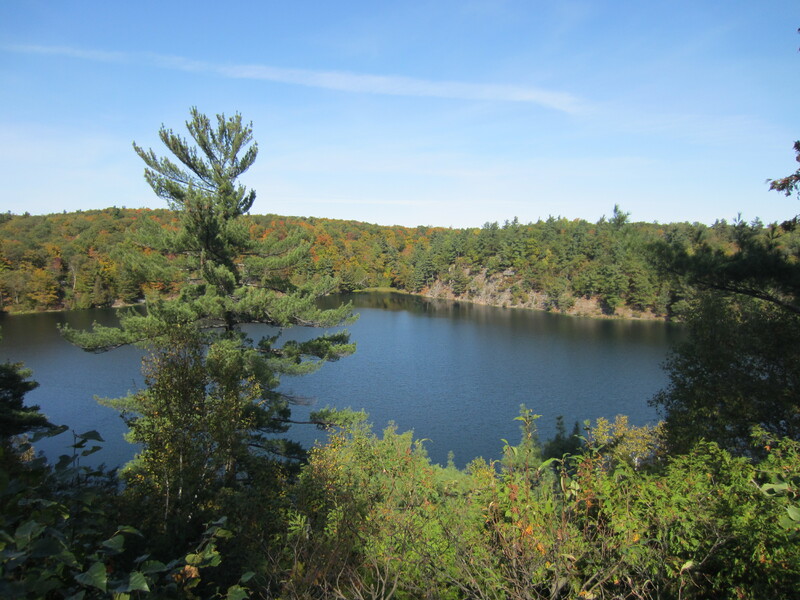 First stop, Gatineau Park, the park with Meech Lake, which is famous to Canadians as the infamous Meech Lake Accords were drawn up here. I won’t bore people with this story, as, quite frankly, it is a boring political tale that only Canadians could appreciate, for about 5 seconds. The park is minutes from downtown Ottawa, in Quebec and is massive As a note, it is the only federal park not covered by Canada’s National Parks Act. It covers 360 sq. km and contains many lakes. We were in a bit of a hurry so we did not explore as much as we would have liked. We made a stop at an interesting lake, Pink Lake. Apparently, it is a meromictic lake. This means the lake has layers of water that do not intermix. For all intents, nothing can live in the lake. Fascinating. 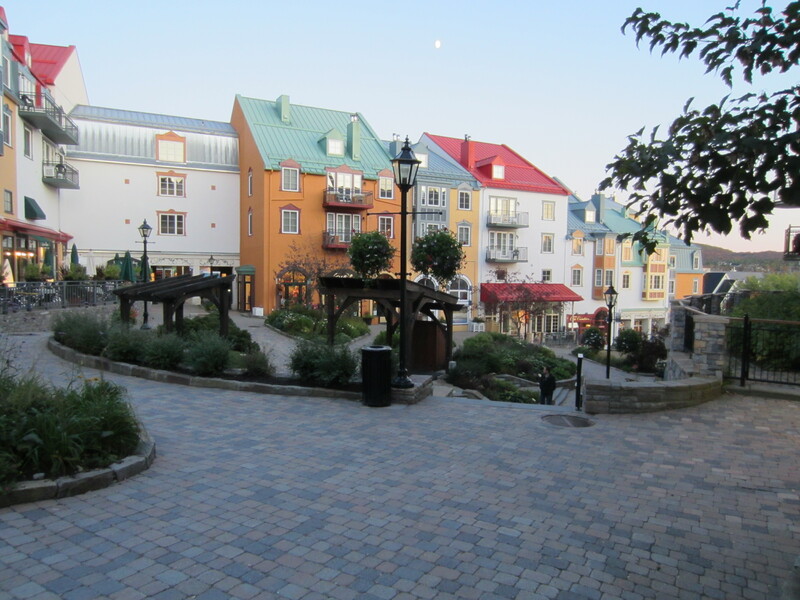 From here it was time to make our way to Mont Tremblant. 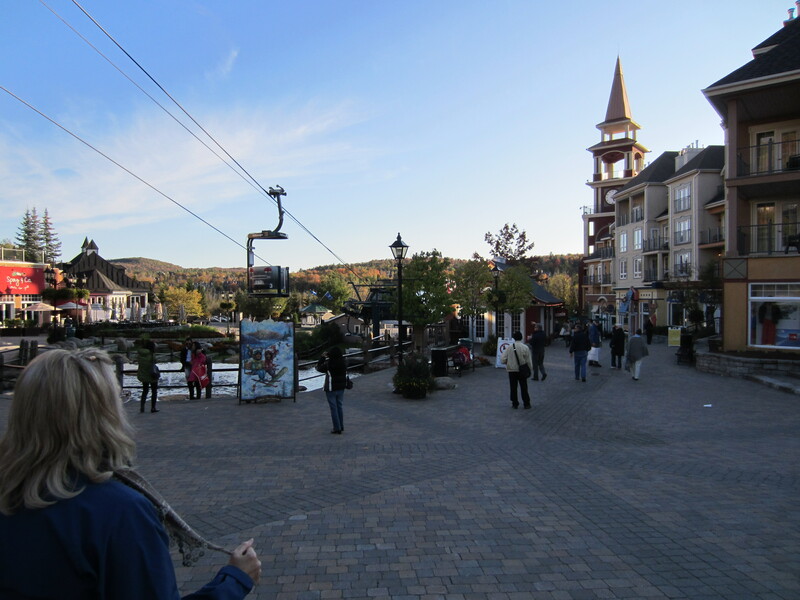 A ski resort in winter and an all season resort, Mont Tremblant is a go to place for people in the area. Basically a couple of hours east of Ottawa and a couple of hours north of Montreal, the place is always packed with tourists. The drive itself was amazing. We had nothing to look at but beautiful vista after beautiful vista for the entire drive. Amazing country. Upon our arrival, we checked in and parked the car, not to be seen again for 2 days. The first impression, nothing like it in the Rockies of Alberta. The townsite was wonderful. Shops, restaurants and the view. Very nice place. After a quick tour around the town, we did as we normally do, check out where the shops are, then go for a beer. 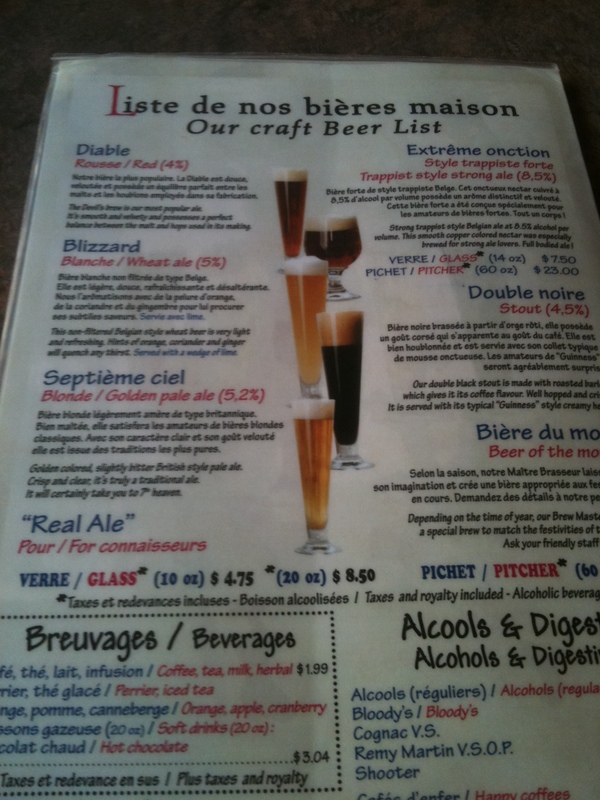 We found a handy spot, just outside our hotel called Microbrasserie La Diable. They brew their own beer on site, and it was a good one. I tried the blonde, and it was excellent. Now, with our thirst sated and our bellies full of tacos, we headed off to finish our exploring. We found some more nooks and crannies and decided that this was one heck of a place. Having arrived late in the afternoon, we started looking for a place to eat and settled on a pizza restaurant, the Pizzaterria. As usual, we had an excellent meal, washed down with just a smidge of wine. We then headed back to our hotel, Residence Inn (Marriott), where we turned in for the night. Big day tomorrow as we had some mountains to conquer.